Junior middlewight Jeison Rosario, background, enjoys victory as Jamontay Clark, foreground, absorbs his first loss. 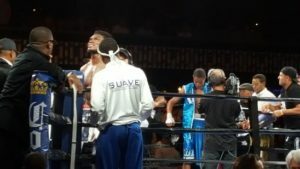 Junior middleweight Jeison Rosario of Miami, FL by way of the Dominican Republic, stole the show at the Armory in Minneapolis on August 24, presenting a perfect lesson in dismantling a taller southpaw as he handed Jamontay Clark, Cincinnati, OH, his first loss. Rosario, bringing his record to 16-1-1 (8KOs) with this victory, eschewed the one dimensional, “always move to the left and never move any other direction” orthodox approach to fighting a southpaw and moved whatever direction kept Clark, whose record fell to 13-1 (7KOs), in front of him. While Boxrec,com lists both men at 6’-2’’, Clark is clearly a taller man, and his reach is listed at 80 inches and Rosario’s is listed at 73. From the opening round, Rosario stalked Clark, who at times was indeed able to utilize his reach with the jab but often crouched much more than necessary. Rosario maneuvered into punching range matching jab for jab with hands up and slipped well, showing Clark he could and would land a hard right hand throughout the fight. Although the first round was competitive and close, Rosario clearly had the upper hand. In the second Clark seemed to establish some momentum, landing some clear punches to potentially take the round. Then, in the third, Rosario landed a squarely placed straight right hand that dropped Clark with a momentum that rolled him headfirst out of the ring. Clark rose from the arena floor and was back in the ring in plenty of time to beat the 20 count from referee Mark Nelson (a fighter is allowed a full 20 count when knocked out of the ring). As the action resumed Rosario came forward to attack Clark against the ropes, landing mostly head shots with a couple of attempts at the body, but Clark effectively clinched to tick away the necessary time to finish the round. After that, the fight was all Rosario. Rosario won a unanimous decision with scores of 99-90, 98-91, and 90-92.